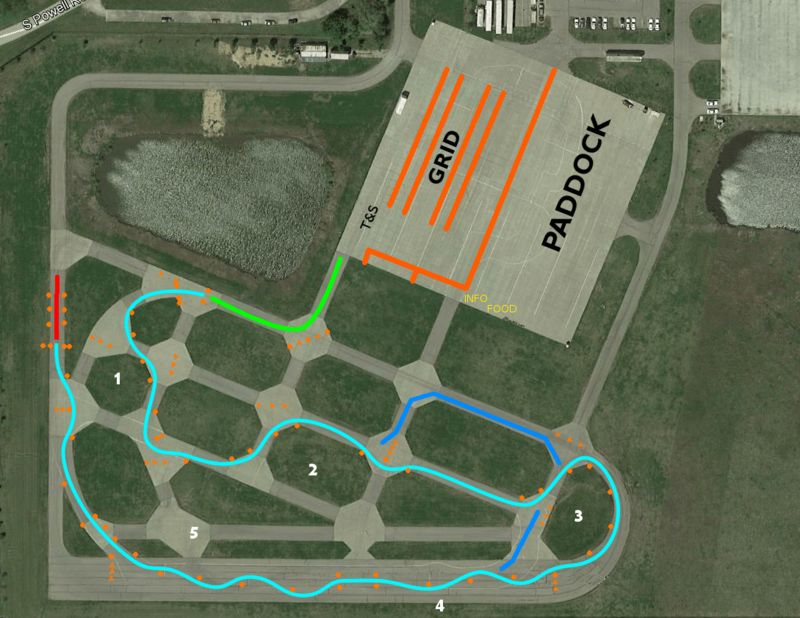 The preliminary course design is set for the first event of the 2016 Kansas City Region SCCA Solo Championship season. As is always the case in any Solo event, initial course maps should be treated as an initial estimate, and not as a definitive final product. The final layout will depend upon both weather and the integrity of the asphalt surface. The start and finish lights are indicated by double-cone gates. The green line is the approach to the start line, and the red line is the run-out after the finish. The light blue line indicates the tentative course path, and the dark blue line represents an alternative path if the sweeper on the right side of the map is unusable. If you have not registered for Solo Event #1 yet, don’t delay! You can register online at MotorsportReg.com: http://msreg.com/KCR2016Event1. Tagged Course Map, Event 1, MCC, solo. Bookmark the permalink.